Hale Hamilton’s hugely successful and highly acclaimed military nitrogen portable charging unit has now been launched into the non-military sector. The portable Nitrogen 2 Go (N2GO) is now available in the civilian market and is expected to prove every bit as successful as the military version. First used by the UK Royal Air Force, the portable gaseous ground support equipment is now in daily use with foreign military forces in countries far and wide, from Australia to India, Malaysia and Singapore. The product was originally developed in the mid-2000s as a direct response to a competitive tender from the UK Ministry of Defence Air Support IPT. 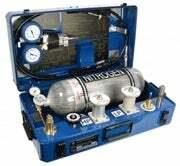 Hale Hamilton developed a range of all-new portable nitrogen and oxygen charging units, or PCUs, to replace the Hale Hamilton ‘walk around’ kits that were in service at the time. The MoD determined that Hale Hamilton’s new PCUs best met the pre-determined criteria which included low weight, ease of portability and the provision of both high and low pressure nitrogen outputs. The company supplied 1000 PCUs which remain in service with the UK military across the globe today backed with a guarantee of ongoing, through-life suppor, that reflects the products quality and integrity, the PCU’s. As a result of the continued success, there had been an increasing demand for a civilian, or non-military, product equivalent. Hale Hamilton has therefore developed the nitrogen PCU and its variants to meet the operation and maintenance needs for most commercial airliners, business jets and helicopters. Now available with the option of wheels, extending handle and a removable lid, Hale Hamilton’s N2 Go range of portable nitrogen charging units leads the field in portable gaseous ground support equipment today. Trevor Bignold, Hale Hamilton’s sales manager, is delighted with the successful development of the company’s latest product: "It is easy to carry our PCU out on to the flight line by hand or in a van and with 300bar nitrogen you can top up tyre pressures, charge a strut or charge door accumulators. It can also be flown fully-charged, subject to our customer having approval. It really is a handy source of nitrogen on the go. We now call it N2 Go!" For more information on our nitrogen charging units please click here.